If you’re an avid adventurer, then I believe you’re aware of how fun kayaking can get. And, if you venture out often, I believe there comes a time when you’ll decide to buy your own kayak. But, how much do you really know about kayaking? You see, when asked to close their eyes and think about a kayak, most people will certainly think of a hardshell kayak. But, if you dig deeper into the world of kayaks, you’ll realize that inflatable models are gaining raising popularity making it increasingly difficult to choose which type of kayak to venture in. So, if you’re here and you’re looking for a good kayak resource, don’t worry as this article is here to clarify things before you make your next move. Just like you’ve already predicted, inflatable kayaks require you to fill them with air so that they can inflate for buoyancy. Following advancements in technology, these kayaks have gained popularity partly due to their affordability, and partly due to their advanced constructions that have made them more progressively similar to their hardshell counterparts. Another major plus of inflatable kayaks that has made them so popular is their lightweight and cost-effective characteristics. On the weight side, these kayaks are so light that you can easily carry them in a backpack. On the cost side, these kayaks are budget-friendly making them the best option for beginners who haven’t made up their minds about taking kayaking as their favorite sport. These types of kayaks have been around for quite a long time in history. Traditional hardshell kayaks were made of wood. However, following advancements in technology, more and more kayaks in the hardshell bracket have been developed to improve the performance. Today, these kayaks are made of plastic, composite, special wood, and fiberglass materials to improve their efficiency. So, which one’s the best? Well, the heated debate on which kayak is the best between these two has continued to spark even amongst the most experienced kayakers. Therefore, to end this debate and find out which kayak is best for you, this article will try to pit the pros and cons of each kayak against each other to see which one stands out as the prime winner. The phrase inflatable can easily mislead you when it comes to durability. Most people believe that hardshell kayaks are more durable than inflatable kayaks due to the nature of their hardness. But that’s not the case. Inflatable kayaks are made of durable rubber and PVC to make them withstand extreme knocks and bumps. Most recent inflatable kayaks feature the latest “drop-stitch-technology” that allow small fibers inside the board to interlock when the kayak is inflated to create a tough durable surface. Hardshell kayaks, on the other hand, are very difficult to maintain and are thus susceptible to damage as compared to their inflatable counterparts. These kayaks, unfortunately, lack the rubber or flexible exterior leaving them susceptible to heavy impacts such as knocks, bumps, and scraping. This is another factor that is of paramount importance when choosing a kayak. 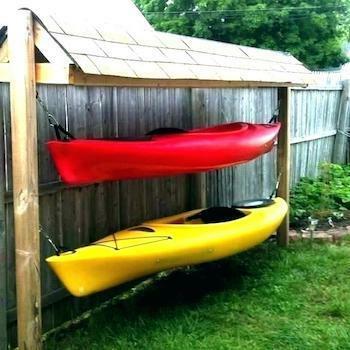 Before you make your move, you should first think of storage to determine which kayak type to invest on. Speaking of the hardshell kayak, this type of kayak doesn’t inflate or deflate. You’ll, therefore, have to think of a perfect storage space such as your garage, utility room, basement area or shed where you can store it securely. You also need to invest in a good kayak roof rack to transport it from destination A to B. On the other hand, an inflatable kayak doesn’t put you under such pressure as all you have to do is to inflate or deflate it. However, there are some key considerations you need to think about when it comes to inflating or deflating. The first one is the time it takes to inflate the kayak. The second consideration is measuring the PSI (Pound per Square Inch) to determine the precise level of air that’s enough for optimum performance. Just like we mentioned earlier, inflatable kayaks are much cheaper than hardshell kayaks. In fact, these kayaks are almost half the price of most hardshell kayaks making them the best for beginners or perhaps those struggling economically and need a budget kayak to quench their spirit of adventure. However, if you’re already an established kayaker or perhaps you‘ve already made up your mind to kayak for long-term, then a hardshell alternative will definitely be the best option. When it comes to ease of usage, hardshell kayaks are considered to be more convenient than their inflatable counterparts as you only need to transition them into the water without wasting any time. Likewise, hardshell kayaks are easy to maneuver as they give you more control especially if you’re a professional kayaker with advanced skills such as stroking, edging, bracing and Eskimo roll skills. On the other hand, inflatable kayaks are more stable and have less rocky motion. Due to the advancement in technology, inflatable kayaks are becoming more effective in all sorts of waters and have gone ahead to beat their hardshell counterparts in their own game. However, inflatable kayaks have one major setback—they’re very light. With such a setback, these kayaks are extremely hard to control leaving them as the only option for kayaking in rough waters or aggressive rivers. When it comes to load and weight capacity, inflatable kayaks have totally dominated in this area as they’re easy to lug around and can surprisingly carry a heavy load. Although these kayaks weight as little as 25 pounds, they have the capacity to endure loads of up to 500 pounds which is equivalent to two peddlers each loaded with gear and paddles. Although hardshell kayaks are considered to be strong, they are usually solo kayaks and don’t have the capability to carry such loads. Check out this article if you are into tandem kayaks. Here, the hardshell kayak is generally the winner. This is all thanks to its highly comfortable seat that’s perfectly secured with a spray skirt to prevent the rider from getting wet. On the other hand, the inflatable kayak lacks this advantage and will expose you to water leaving you wet and very uncomfortable. 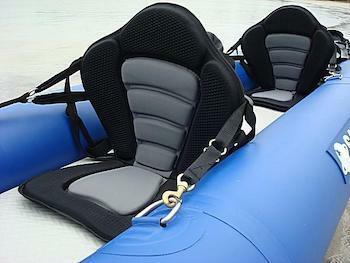 However, if you’re a kayaker suffering from back pains, then replacing the standard seat with a more advanced strap-in seat (in an inflatable kayak) will perform the trick as it will make you comfortable through reducing pressure points when riding. Check out this article for more kayak accessories that can help with your kayak adventure. As you can see, choosing between an inflatable and a hardshell kayak will always melt down to personal preference. Your choice will largely depend on several factors such as the type of water you wish to explore—be it oceanic, lakes, or whitewater rapids, the size, the price, additional features and finally, your level of experience. Once you’ve decided which kayak to consider between the hardshell and the inflatable, its time to look at the huge selection of high-performing models which you can choose from in both categories.